but nothing on the Manhattan side to provide protection from the elements except a small cage with a heater for one of the Tram Workers. 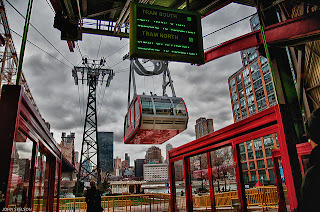 Roosevelt Island Historical Society (RIHS) President Judy Berdy has had enough with these as well as other Roosevelt Island Tram problems and let loose at the Roosevelt Island Operating Corp (RIOC) December Board of Directors Meeting during it's Public Speaking session last Wednesday. She was Pissed Off! The tram opened on November 30th to great fanfare. Unfortunately, there was little planning for service coordination after that date. In this freezing weather, which RIOC should have know happens every December, There are no shelters in Manhattan or on the island. The Manhattan station has no shelter, just a guard booth that is on the wrong side of the turnstile. The Manhattan Metrocard machines break down and there is no resolution since RIOC refuses to let POMA sell Metrocards from the booth. The tram doors do not open halfway so any heat in the cabin instantly dissipates when the doors are left open 6 feet to admit passengers. The island station is a further disaster with no shelter. Where is a PSD officer to guide pedestrians? This would be a worthwhile use of their time instead of patrolling the island in their warm vehicles. I am sure we can spare one officer during tram operating hours for traffic duty. Waiting for spring is not an acceptable answer. I have heard from all my neighbors about the mess at the tram and bus. You are not saving any money running only one cabin,. That is a PR fiction to make us look green. It makes me see RED. Just run the two cabins as before and at least that will mean we have a quarter hour schedule again. You are alienating your ridership. Just watching from the kiosk, the non rush-hour ridership is down, way down. Residents do not want to be abused and made to wait unacceptable lengths of time in the cold just to ride the tram. They will stay with the F train. At least there is shelter from the cold. Here's the tourist view of how the Roosevelt Island Tram works. 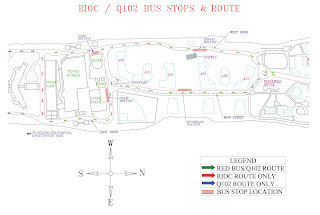 To be fair to the Directors and Staff at RIOC, they are aware of these problems and are trying to find solutions as reported in this earlier post regarding the bus route. It's is just very frustrating for those using the Tram and Red Bus on a daily basis. Are you interested in a job as an Infant/Toddler Teacher with the Roosevelt Island Day Nursery? If so, this December 14 listing from Craigslist may be of interest. Roosevelt Island Holiday Concert - A Free Night Of Classical Music Presented By Rosemarie & Robin Russell Family Concert Series Saturday Night, December 18 - Come Listen To Bach & It's All Free!! 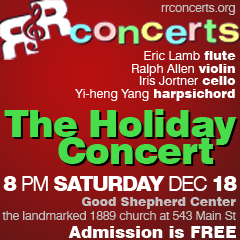 This Saturday night, Roosevelt Island's own local Rosemarie & Robin Russell Family Concert Series will be presenting their Holiday Concert, a free evening of classical music at the Good Shepherd Community Center starting at 8 PM. Here's a brief taste of the wonderful music you will experience if you attend. Bach's Sonata No. 3 in g minor for Viola da gamba and Harpsichord. More information on the R&R concert series from previous posts. As reported in earlier posts, all reports from previous concerts are that if you go, you will have a great time. Possible areas include Roosevelt Island, Governors Island, Staten Island and the Brooklyn Navy Yard in Sunset Park. The Roosevelt Island site being considered for the new Engineering School is the Goldwater Hospital Campus on the southern end of the Island that will be closed in about four years. A top notch engineering school would certainly be a great use for that beautiful site. It would be far better for Roosevelt Island than more luxury condo development. A state-of-the-art Engineering School nicely complements Roosevelt Island growing reputation as a place for new technologies, such as electric car charging stations, wireless parking sensors and more, to be tried out in an urban setting. Mayor Michael R. Bloomberg, Deputy Mayor for Economic Development Robert K. Steel and New York City Economic Development Corporation President Seth W. Pinsky today announced that the City is seeking responses from a university, applied science organization or related institution to develop and operate an applied sciences research facility in New York City. In order to maintain a diverse and competitive economy, and capture the considerable growth occurring within the science, technology and research fields, the City is looking to strengthen its applied sciences capabilities, particularly in fields which lend themselves to commercialization. The City will make a capital contribution, in addition to possibly providing land and other considerations, commensurate with the respondent’s investment. 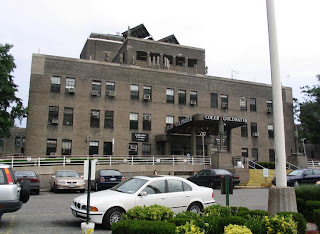 Through a Request for Expressions of Interest released today, the City will suggest four possible development sites – at the Navy Hospital Campus at the Brooklyn Navy Yard, the Goldwater Hospital Campus on Roosevelt Island in Manhattan, on Governor’s Island, and at the Farm Colony on Staten Island – though respondents are also encouraged to consider and propose privately-owned sites within the five boroughs in which an applied sciences facility might be developed. New York City is home to more than 626,000 students, including more than 4,200 graduate engineering students. And while our more than 100 academic and research institutions are renowned worldwide, there are unparalleled growth opportunities that now exist within the science and technology fields, and a global competition going on to take advantage of those opportunities. As the demand for talent outpaces supply around the world, it is important that New York City take steps to increase its pool of engineering faculty and graduate students, as well as research expenditures. Other countries are already investing heavily: research and development spending in Asia is predicted to overtake U.S. levels in the next five years, thanks primarily to striking growth in R&D investment in China. The Request for Expressions of Interest released today by the New York City Economic Development Corporation seeks proposals for the development of an Applied Sciences Research Facility with a strong focus on applied engineering. Other fields within the applied sciences including environmental science, mathematics, chemistry, physics and computer science will also be considered, with a focus on fields that present significant opportunities for commercialization. A majority of the development must be for academic use, and could include teaching space, wet and/or dry labs and conference facilities. Proposals that also include space for related commercial activity such as business incubators, corporate research and development facilities, and spin-out companies are strongly encouraged, as are joint-ventures and consortia proposals. Upon receiving responses to the Request for Expressions of Interest, the City will evaluate proposals and develop an Applied Sciences Research Request for Proposals to be released shortly afterward. The Request for Proposals will request conceptual architectural design, more detail on the development team, detailed financial information and will include a draft contract. Final developer selection will be based upon responses to the RFP. To obtain a copy of the complete Request for Expressions of Interest, please visit www.nyc.gov. 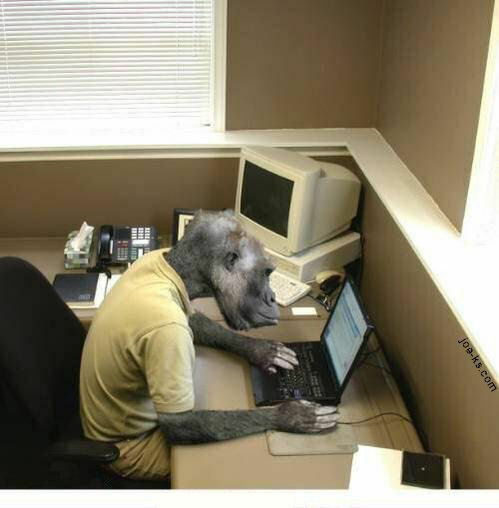 Responses are due on March 16, 2011 at 5:00 PM. Now that the fun and excitement over the Roosevelt Island/Park Slope first round battle for the Curbed Neighborhood Of The Year is over, it's back to daily life on Roosevelt Island and issues such as the Red Bus and Tram Operations. Hey Leslie -- It is not all lollipops and roses. Please get the Red bus to pick up and discharge passengers at the Tram ON THE SAME SIDE OF THE STREET AS THE TRAM after 7 am. Anything less is an accident waiting to happen, and it is cruel to our elderly and disabled neighborsn not to mention many of our youngsters who go to school in Manhattan and do not excercise any precaution when crossing the street. And then get a bus shelter up there too. And move the bench from the outer edge of the station to the more protected area where it used to be. Common sense seems to have gone out the window with the re-opening of the Tram. Running one cabin during the day ? Pretending no one will notice ? The easiest way to make the crossing of the street safer would be to make it a one-way, bus-only lane. Paint a crosswalk sign on the street and we are done. Any other complains are just because of laziness or rain-allergies. Crossing a street is now a "haul"? I am speechless. What is wrong with us if we don't even want to walk a few steps anymore? I agree that the crossing should be made safer: buses only, a cross walk, or even maybe make the street narrower or build a passenger loading bay. But complaining that walking 10 more steps is unacceptable is just silly. Oh, maybe the bus fare should be bumped up to a dollar. Maybe that will refocus the complains. The majority of RIers don't care much if the bus stops on the north or the south side of the street. They all understand that walking a couple more steps is not going to kill them. I have talked to many people who take the bus and the only thing that pisses everybody off is the bus not being in sync with the tram right now. This issue was raised and discussed during the RIOC Board of Directors December 9 Operations Committee meeting. The discussion was very interesting and sometimes quite heated. 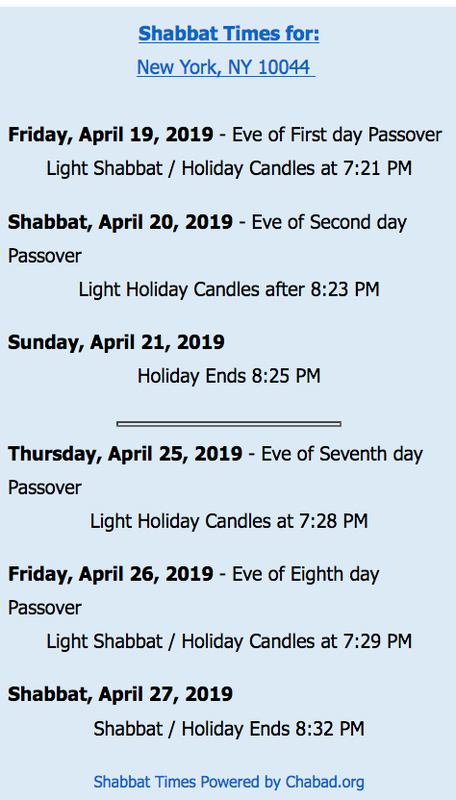 In the past, I would recommend that you listen to the discussion yourselves on the audio web cast but it appears that only the first 27 minutes of the more that 2 1/2 hour meeting is available. The Red Bus and Tram Operations discussion took place later in the meeting and is not included in the audio web cast. This is what happened. RIOC's VP of Operations Fernando Martinez presented a review of the first week of Red Bus and Tram operations following the return to service of the new Tram System. Here's the Roosevelt Island Tram Station Plaza East/West Cross Street from above. in the spot where the Tram workers now park their cars near the construction trailers. make another right at the South Side of Sportspark to the West Channel Road (facing Manhattan) and head north to resume it's route on Main Street towards the subway station. Before it gets to the Subway Station, the Red Bus will also stop next to the Visitors Center Kiosk. One Board Director asked if a canopy similar to the one that leads from the South Side of the Tram Station to the Tennis Club could be placed at the proposed bus stop to protect riders from bad weather. Another Director asked if the Red Bus could just back up a bit from the new stop and then go around the turnaround as it did before the old Tram went out of service. The Director added that if necessary, a curb cut in the sidewalk adjacent to Firefighter's Field could be done. Mr. Martinez responded that he did not think it was possible for the Red Bus to safely make the Tram Turnaround from the proposed new Red Bus Stop. Mr. Martinez did say that an additional ramp could be installed by the Tram Station Staircase but that would have to wait until spring when the weather get's warmer to mix concrete. In the meantime, Mr. Martinez promised that a new temporary bus shelter will be installed at the current Tram Station Stop. 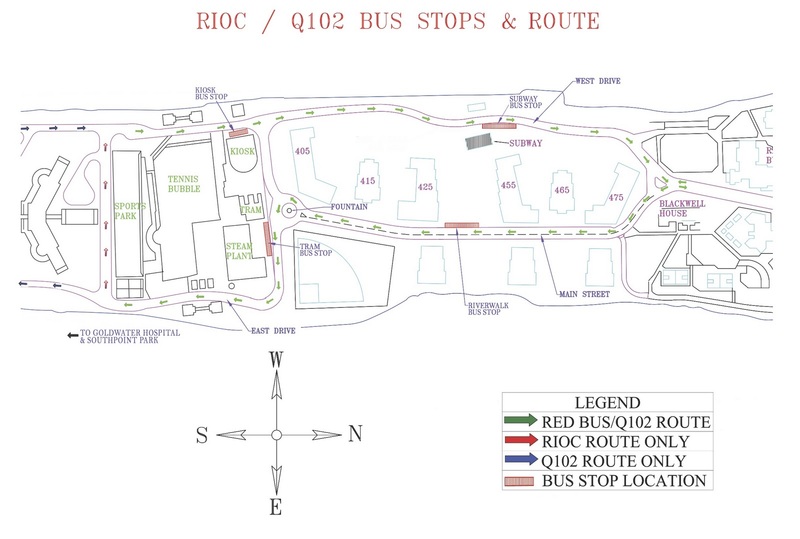 FYI: RIOC has just installed a passenger shelter for the bus stop across the street from the tram. Remember this is just a proposal right now and not the definite new route. So, what do you think of the new proposed Tram Bus Stop and Route? Another issue with the Red Bus Stop occurs at the Subway Station. Will have more on that later. 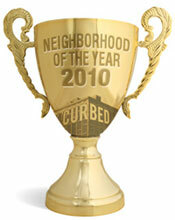 Alas, the Great New York City 2010 Curbed Neighborhood Of The Year upset was not be. The Goliath Park Slope has defeated the Roosevelt Island Ru-dy in a crushing blow to our plucky little Island. After leading Park Slope in the vote tally most of the day yesterday and even into the morning hours today by an approximately 57% - 43% margin with over 1600 votes cast, I was happy to receive an email earlier this morning from a reader advising that we had achieved an enormous upset by defeating Park Slope. Minutes later, I was stunned to receive an email from the same reader reporting that Roosevelt Island had lost. I went to the Curbed web site and saw the final tally to be Park Slope 53.7% - Roosevelt Island 46.3% with total votes of 1175. Roosevelt islanders wrapped up in curbed scandal! It was fun while it lasted. We'll get them next year. I'm happy that we didn't win - my rent's too damn high! The Roosevelt Island Operating Corp. (RIOC) will be holding it's December Board of Directors meeting Wednesday, December 15 starting at 5:30 PM. The meeting is being held at the Manhattan Park Community Center instead of the Good Shepherd Community Center. A 30-45 minute public comment period wherein those who sought to address the Board would have pre-registered, with time for any speaker limited to two (2) minutes. Pre-registration would be accomplished by addressing RIOC at its web site or in person at RIOC's office prior to the day of the meeting. Public comment should be for the purpose of receiving comment, not to engage in debate or colloquy with board members. The Chair would control the time and limit for each speaker. By scheduling the public comment period as above, the town hall style session following alternate Board meetings should be obviated. The RIRA meetings now held the evenings before each Board could function as the equivalent of a town hall meeting, with Board members attending as they wish, but with the expectation that a senior RIOC staff person would also attend to answer questions on Agenda items. If you want to speak to the RIOC Directors make sure you sign up today. Below is the Agenda for RIOC's December 2010 Board Of Directors Meeting. 1 The RIOC Board Meeting will commence following a public comment period, which is not a part of the RIOC Board Meeting. The entire Proposed RIOC fiscal year 2011-12 Budget is here for your review. More on RIOC's Proposed 2011-2012 Budget here and here. Well folks, Roosevelt Island has made it into the Sweet 16 Round of the prestigious 2010 Curbed Neighborhood of the Year Award. to advance to the next round. Roosevelt Islanders, do not fear such a battle, others before us have overcome similar odds. Remember David beat Goliath and Rudy made the Notre Dame football squad despite being told over and over that he couldn't do it. If David and Rudy could win their battle against overwhelming odds, why can't Roosevelt Island beat Park Slope? No question about it - The 2010 Curbed Neighborhood Of The Year has got to be Roosevelt Island. For development, who can beat the spectacular new Roosevelt Island Tram with it's convenience and amazing views of the waterfront and NYC skyline. There's also 2 new waterfront buildings right next to the tram and subway. As to restaurants we got the new Riverwalk Bar & Grill with their special football menu of 35 cents hot wings- mmmm good. Pretzel Turkey sandwich was pretty tasty too. It did open in 2009 but that's practically yesterday for Roosevelt Island. Also, Roosevelt Island's long time operating Trellis Diner recently got an A from the Health Inspector. Retail Development - Our Main Street Retail Revitalization will soon be under way when a private sector Master Leaseholder will hopefully replace RIOC (the government public benefit corporation) as landlord and improve the current "Soviet" style look of Roosevelt Island's retail. All this and more including our parks, green space, community activists, ghosts and creepy spirits (except the under construction Louis Kahn/FDR Memorial which will destroy the great views from Southpoint Park) make Roosevelt Island the hands down choice for the 2010 Curbed Neighborhood of the Year. So go on right now and vote for Roosevelt Island as the 2010 Curbed Neighborhood Of The Year. It's a battle worth fighting. Be wary Park Slope. Here comes Roosevelt Island. UPDATE 3:25 PM - WOW- RIGHT NOW ROOSEVELT ISLAND IS BEATING PARK SLOPE 52% -48%. KEEP UP THE GOOD WORK - RU-DY, RU-DY, RU-DY, RU-DY!!!!!!!!!!!! UPDATE 3:40 PM - Curbed is reporting that there are allegations of ballot stuffing going on from both sides. 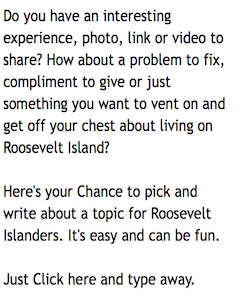 I am sure nobody from Roosevelt Island would do that because we can win honestly. Please only vote once. UPDATE 12:30 AM 12/14 - At this moment Roosevelt Island has increased it's lead over Park Slope with 56.6% of the vote to Park Slope's 43.4% out of a total of 1542 votes. Make of this what you will that in the other contest today, between the West Village and Noho, a total of 660 votes were cast. Subway elevators and escalators are going nowhere fast -- and the City Council is trying to fix the mechanical mess. Councilwoman Jessica Lappin yesterday introduced a resolution that leans on the MTA to investigate poor maintenance work on the subway's lifts, two days after 15 people -- including an infant -- were trapped in the Roosevelt Island station's elevator for a terrifying 30 minutes. We shouldn’t be, but all Roosevelt Island straphangers are familiar with the sight of out-of-order escalators and elevators at subway stations. For some of us, that’s an inconvenience and means we need to walk. However, for senior or disabled riders, these outages can mean the difference between getting into or out of the subway – or not. The MTA has an obligation to ensure that its elevators and escalators actually work. Roosevelt Islanders and New Yorkers across the city deserve to know that the escalators and elevators they rely on are going to be functioning. They need to do preventative maintenance to reduce the number of breakdowns and they need to fix things quickly when something does go wrong. The bottom line is that the MTA needs to maintain its subway stations, and that includes the elevators and escalators. New Yorkers aren’t interested in excuses. We’re interested in results. So far, we aren’t seeing very many of those. Roosevelt Island's Assembly Member Micah Kellner expressed his concern as well. Below is a letter dated December 8, 2010 Mr. Kellner sent to MTA New York City Transit President Thomas Prendergast asking for answers regarding the recent incident in which a number of passengers were stuck in an elevator at the Roosevelt Island subway station. I am writing on behalf of residents of and visitors to Roosevelt Island, which is located in the district I represent, regarding a recent elevator breakdown. As you may know, on December 6, 2010 an elevator at the Roosevelt Island subway station broke down during the morning rush hour, stranding fifteen adults and several children in the elevator for over an hour. Several reports have indicated that the trapped passengers’ repeated calls for help to New York City Transit staff did not result in a timely response, and that it was not until after a passenger contacted 911 on a mobile phone that assistance was received.These reports are highly disturbing. I am concerned that there were not appropriate emergency measures in place prior to the incident, and that NYCT staff apparently did not respond effectively to the passengers’ calls for help. Given the depth of the Island’s station, it is unlikely that residents will be able to use their mobile phones in most emergencies. The elevators and escalators at the Roosevelt Island station have been a recurring problem, with frequent outages that restrict Islanders’ already limited transportation options. Particularly given the large number of Island residents who are elderly or have disabilities, it is important that the station’s elevators are kept in a state of good repair. Indeed, it was in part because of the ongoing problems at Roosevelt Island that I introduced legislation to require timely maintenance of elevators and escalators throughout the MTA’s facilities. Please provide a detailed explanation as to what measures the MTA will take to improve the reliability of the elevators at the Roosevelt Island station and elsewhere to prevent similar situations from occurring in the future. Additionally, what will be done to ensure a more effective response to any future incidents? What steps were taken to assist the stranded passengers at Roosevelt Island? What policies and procedures are currently in place for such situations, and what changes will be made to these policies and procedures in light of the Roosevelt Island incident? 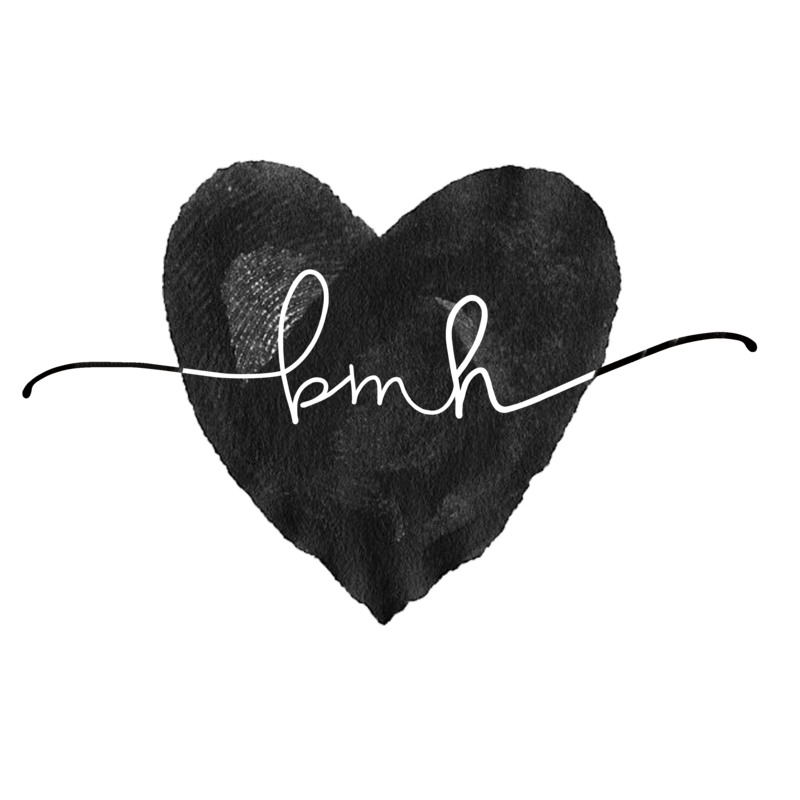 Thank you for your attention to this matter. If you would like to discuss them further, please do not hesitate to contact me at (212) 860-4906. Requires the city of New York or county within the district to make maintenance of escalators, elevators and other facilities in passenger stations a priority; requires daily inspections, reports to MTA inspector general and the management advisory board, emergency repair order after two consecutive daily reports of inoperable facilities, and annual reports by the management advisory board. The MTA maintains an Elevator and Escalator Status Page as well as the email for F Line General Manager. Three friends, Pete, Chris, and Chris grew up on Roosevelt Island and then life took them to different places around the world. They still fondly remember their time on Roosevelt Island and recently got together in their current homes to play some music together. Here's what happened. First Pete uploaded himself playing. Then Chris added his harmonies and Guitar then I added the visual effects and realized I could do more and added to the fracas one more time on Bass and Drums. It's like Photoshop Layer Tag... but with Music. Who wants to add Piano, Choir or a String Ensamble? Once a year the kids who grew up on Roosevelt Island come back and hold a reunion like this one from the past summer. I think I saw a keyboard player in that mix. Don't miss the double rainbow that appeared at Southpoint Park during the 2009 Reunion (2 minute 15 second mark of the video) - Very Spectacular!